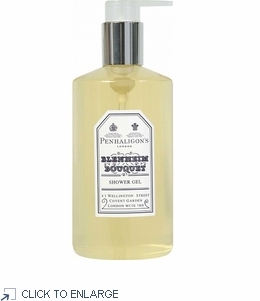 Compare at $38... Stock Up and Enjoy: $30 Penhaligon's Blenheim Bouquet Shower Gel 300ml Pump Dispenser - Spa & Hotel Range Subtle citrus, woody musk, the exhilaration of pine: created in 1902 and named after Blenheim Palace, the home of the Dukes of Marlborough. Later a favorite of Churchill, this is the classic perfume of England. This bath and shower gel is designed to produce a rich lather and contain gentle ingredients to help leave skin feeling soft and refreshed. It's easy to use. Simply lather between your hands or apply to a washcloth or sponge. Many like to pour under hot running water for an indulgent foaming bath. Fragrant and invigorating. Get an exhilarating start to your day! Size: 300ml / 1o.1 fl oz pump dispenser. Subtle citrus, woody musk, the exhilaration of pine: created in 1902 and named after Blenheim Palace, the home of the Dukes of Marlborough. Later a favorite of Churchill, this is the classic perfume of England. Fragrance Notes for Blenheim Bouquet: Head Notes - Lemon, Lime And Lavender and Base Notes - Pine, Musk and Black Pepper Inhaling Blenheim Bouquet today, it is hard to imagine it was created over one hundred years ago. It is a fragrance that has continually adapted to every twist and turn of its existence. Blenheim Bouquet is discreet, sensual and immaculately turned out with a flash of heritage. This bath and shower gel is designed to produce a rich lather and contain gentle ingredients to help leave skin feeling soft and refreshed. It's easy to use. Simply lather between your hands or apply to a washcloth or sponge. Many like to pour under hot running water for an indulgent foaming bath. Fragrant and invigorating. Get an exhilarating start to your day! Size: 300ml / 1o.1 fl oz pump dispenser.